A Northampton man who caused more than £15,000 worth of damage to a house after he started a fire has been jailed after he admitted a charge of arson. 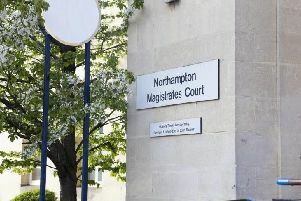 Gary Wingrove, aged 41, set alight a number of his belongings after he barricaded himself into a room he was renting in a multi-occupancy house in Freehold Street, Northampton. Northampton Crown Court heard that four fire engines were called to the blaze on December 28 last year and firefighters had to use breathing apparatus to extinguish the blaze. Dominic Woolard, prosecuting, said Wingrove, who managed to get out of the room after the fire started, told police he had no recollection of how the blaze had started as he had taken 13 sleeping tablets and had been drinking alcohol. The fire caused at least £15,000 to the property and the two other tenants were forced to move out while it was repaired. William Falshaw, defending, said the offence had happened after his client’s mental health had deteriortated following the breakdown of his marriage. Judge Lynn Tayton said Wingrove’s actions presented a risk to the other tenants and the firefighters called to deal with the blaze. She sentenced him to two years and eight months in jail. He is likely to serve half his sentence before being released on licence.